Whether you can’t make up your mind or you haven’t been paying attention to the presidential debates, these five online quizzes will help you decide whom to vote for in 2016. Yes, we will be electing a new president in 2016. Let’s all pretend you already knew that. You’ve probably heard of this quiz since it seems to have taken over the Internet recently. It is more complex than your average quiz. You can answer a few questions, or take your sweet time and answer every single question. You can also choose to spend an eternity on it and delve further into each question. In the end, it gives you your matches based on the percentage of similar standings. Pros: Explains topics you may be unfamiliar with; it gives a wider range of answers to choose from, and it’s more in depth than any other quiz on this list. Cons: Takes FOREVER if you want a sure answer. This quiz is a lot livelier than the aforementioned. It’s short and sweet. There are birds chirping, dogs barking occasionally, outdoor scenery and posters of each candidate. Each time you answer a question and choose your priority of the issue presented, the candidates will move depending on how well you match up. In the end, your “ideal” candidate will be at the very front with the percentage of how well you two matched. Also, if you click on each candidate, it will give you information about him or her. This is the fine medium between IStandWith and VoteEasy. It is less in depth than the former and far less visually pleasing than the latter. However, it edges out the competition with one important feature – You have the option to take the quiz not only for the 2016 presidential candidates, previous elections, congressional leaders, cabinet members, big city mayors, supreme court justices, political pundits as well as your political philosophy. Like the last two, it ranks how you stand with each candidate. Brilliant quiz. 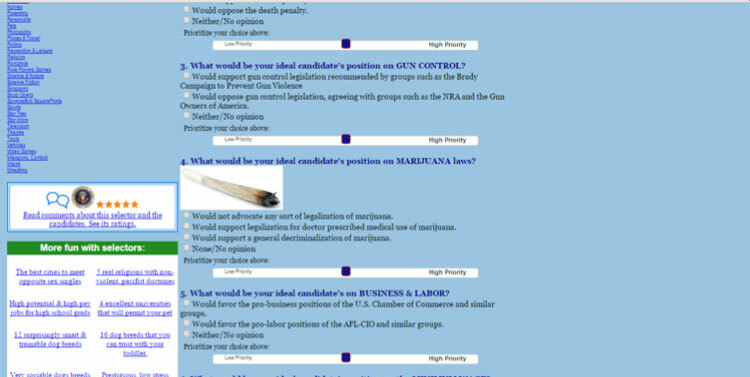 Pros: Quick, more options, gives a lot of information on the candidates. I’ve used Select Smart before but not for the next POTUS. I used it to find what kind of pet I should have back before I got a cat. This quiz is the love child of IStandWith and On the Issues. It has the depth and ability to score your interest in the subject as well as an explanation of why you got whom you got. Cons: Yet another eyesore, and it feels like it’s missing something. USA Today’s quiz is the least in depth and has the weirdest questions (seriously, who asks how old you want the president to be?). However, I added it to the list because out of all of the news sites’ quizzes I’ve taken, this one was the most tolerable. It matched me to the same president I got in three of the other quizzes. Pros: Feels like BuzzFeed, not too boring. Cons: Weird questions, not in depth enough.